Finally and most important, in 2010 I've got Leo. Or rather, I've found him. In my garden. A hungry, motherless least weasel baby (Mustela nivalis / German: Mauswiesel). I didn't have any idea of how to bring up a least weasel baby and so had nobody else I asked for help. Nobody wanted to take this smallest of all predators, and our town's official veterinarian would have had to put it down, if neither its biological mother nor anybody else would have taken care of it. Its mother didn't turn up and so I decided to give it a try. 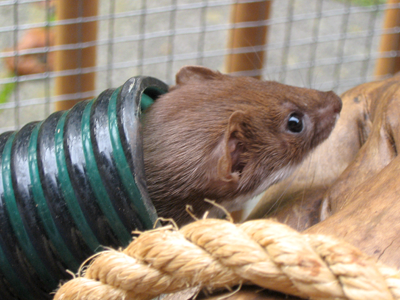 I didn't know what to expect, but today my least weasel is a beautiful, strong and healthy youngster. I found Leo at the end of July when he still needed to be coddled up for some time before being released back into the wild. But September was cold and nasty and when I finally found out how to prepare a proper release, it was too late to do it that autumn. My vet said, at that point Leo no longer was a wild animal but a domestic one and release could not be undertaken before May. So I made arrangements for this unexpected, prolonged cohabitation. There is still Mini, my beloved cat, who would be more than pleased, if she could put a paw on Leo, and very often it is stressful and time consuming to juggle Mini, Leo and my own needs. But I'm thankful too to get so exceptionally close to such an animal. I really love that cute little guy and we will see how this goes on. If there is anybody out there with at least a little bit of experience with a least weasel, I would be grateful for any tips.